Ronda Rousey lost the RAW Women’s Championship to Becky Lynch at WrestleMania. She hasn’t been seen on WWE programming since. According to a recent report from Fightful, she is scheduled to have surgery on her broken hand this Tuesday. WWE are officials are said to be hopeful she returns to the company later this year or next but there is no timetable set for her return. Rousey documented the diagnosis of her broken hand on her YouTube channel. In the video, Rousey is shown getting her hand X-rayed and meeting with Triple H and Paul Heyman. Ronda Rousey recently competed arguably the most amazing rookie year in the history of pro-wrestling. She wrestled her 1st professional match at WrestleMania 34 and her latest at WrestleMania 35. She wrestled 67 matches during that period, winning 66 of them. 37 matches of her matches were on WWE live events not shown on television or streamed online. 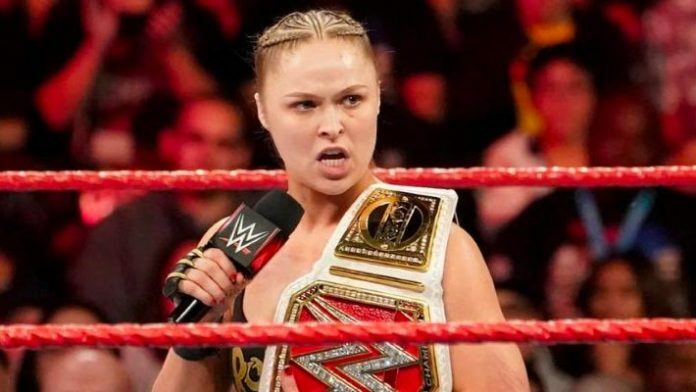 Rousey held the RAW Women’s Championship for 231 days and defended it 10x on WWE programming. She defended the title another 20x on WWE house shows. Rousey’s only loss during her rookie year came in the main event of WrestleMania 35.